1. On a visit home, your son brings a beer making kit. His fiancé, who gave it to him a year ago, has threatened to re-gift it if he doesn’t use it soon. 2. Son and fiancé boil up the brew, pour it into a large jug, and top with a thingy. The instructions say to store in cool, dark place. 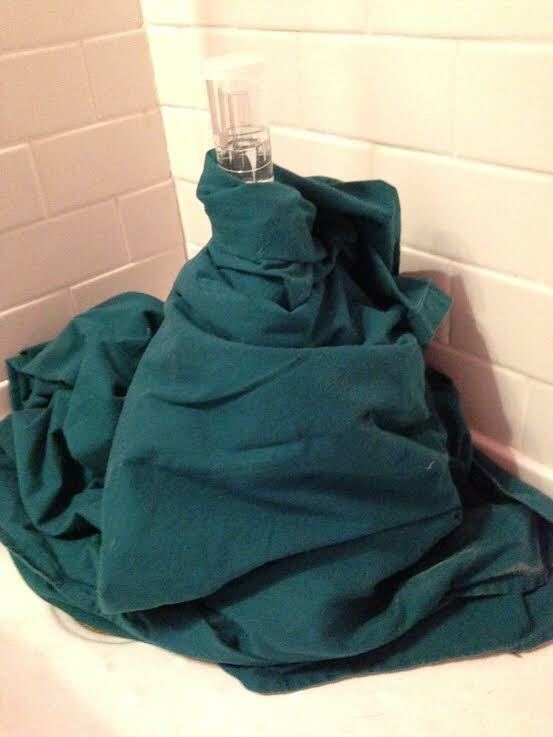 They wrap it in a sheet and put in the downstairs shower. 5. Begrudgingly admit that you can as you review the things you are no longer capable of doing—the splits, staying awake past ten p.m., recalling your mother’s maiden name. Embrace this opportunity to impress your adult child. 6. The night before bottling, son calls to remind you. It’s a good thing because you want to pretend you forgot, let it expire beyond the two-week deadline, and toss it out. 7. Read the instructions. Read again—and again. One more time. Learn a fun fact: the sludge at the bottom of the jug is called trub. Think about watching the suggested online instructional video. 9. In the morning, take a Lorazepam to reduce anxiety over your fear of accidentally siphoning trub into the bottles. In the meantime, sanitize the bottles and review the instructions. Think again about watching the online video. 10. Once the medication kicks in, enlist the assistance of your Baby Daddy. Give him the job of sucking on the end of the siphon tubing to get the flow going and inserting it into a bottle. 11. With one hand, hold the racking cane in the jug, ever vigilant to keep it away from the trub. With your other, place your thumb and finger on the tubing clamp to stop the flow when a bottle is full. 13. In a panic, pull the racking cane from the liquid. 15. 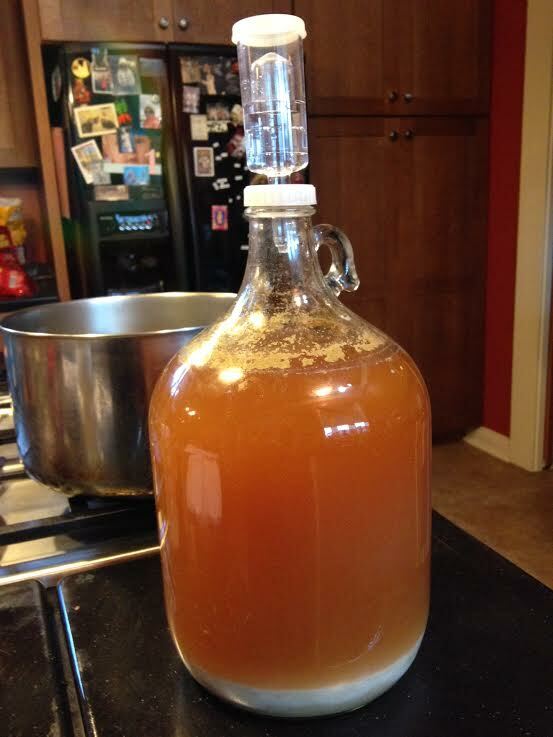 After a couple of filled bottles, begin to enjoy the process—that is, until you start on the capping. How much pressure is too much pressure? Maybe you should watch the video. 17. Before you know it, you’ve got 10 bottles of beer. 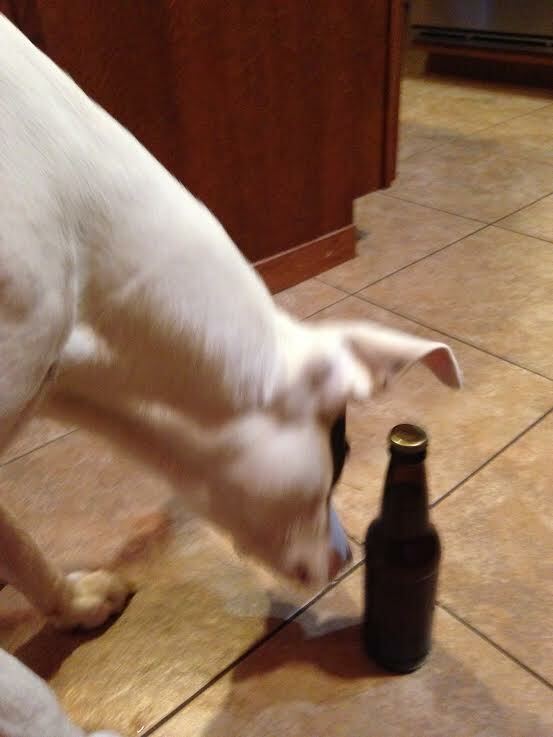 Let Lucy (or whatever you call your dog) sniff for quality control. Feel proud that you accomplished your task with a minimum of bickering and trub in the bottles. 18. Store the beer in a box. Place on the back porch in case one explodes. (Thank friend Larry for this tip). 20. 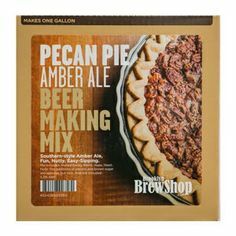 It’s Pecan Pie Amber Ale. Must be an acquired taste. 21. Give yourselves pats on the back. You did something you never imagined—something you’ll never do again. 22. Make son buy you dinner. 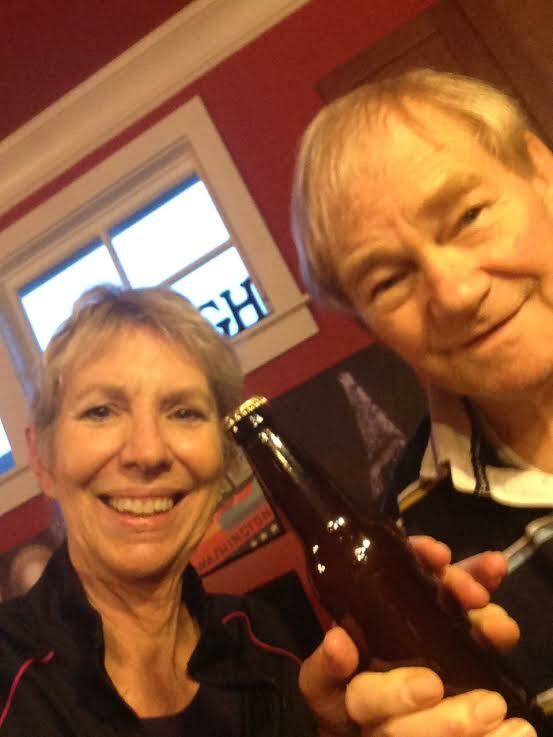 This entry was posted in Fort Bragg California, Northern California, Small Town and tagged Beer, Brooklyn Brewshop, Home Brew, Parents & Adult Children by Kate. Bookmark the permalink. Reblogged this on dreamer girl. Hilarious, Kate. Reminds me of our wine-making efforts. We saved bottles for “a special occasion” and needless to say, when we finally opened one it was undrinkable. I am soooooo proud of the ‘reluctant brewmasters.’ 10 bottles and no one was hurt. And I learned something. It’s trup. All these years I’ve called it sludge. Great job. Okay, I’m sending this to my son, Thomas, who owns the Ugly Dog Pub in Highlands. I’m sure he’ll want to add Pecan Pie beer to his offerings.